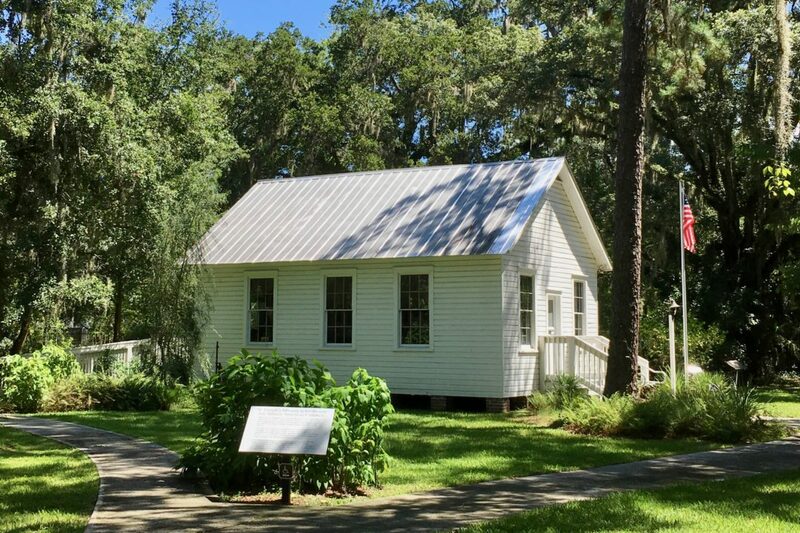 Visit the last remaining one-room schoolhouse in Duval County, built in 1898 specifically for the education of black Mandarin residents. Following the conclusion of the Civil War in 1865, new opportunities arose for black children to receive a formal education, yet because of racial prejudice, black and white students could not be taught together. Among those committed to teaching black children in post-war Florida were the Sisters of St. Joseph, members of a Roman Catholic religious order from Le Puy, France, who established their first Mandarin school in 1868. Other equally successful schools were founded by African Americans themselves, Northern missionaries, and the Freedmen’s Bureau. Moved to its present location in 2015, this schoolhouse was originally located on the St. Joseph’s Church property at the corner of Loretto and Old St. Augustine roads. There, the Sisters began their Mandarin Mission, opening a free school for both black and white students in the area. This special building now serves as an educational venue highlighting the historic aspects of this one-room schoolhouse and others like it that are now gone. A permanent exhibition tells the fascinating story of the French Catholic Sisters who came to America and honors African-American families of Mandarin, whose drive for learning surpassed all challenges put before them. At the conclusion of the Civil War, many individuals stepped forward to educate black children, who had previously been denied opportunities to pursue formal education. Shortly after the war ended, Bishop Augustin Verot of the Catholic diocese of Savannah and St. Augustine returned home to Le Puy, France, to recruit a group of Sisters to come to Florida to teach black children and establish a stronger Catholic presence in the region. In his appeal to them he said, “It is my wish that you understand clearly and perfectly, that it is for the care of the Negroes, and for them only, that I am seeking Sisters of your order for my Diocese.” Bishop Verot was first appointed as Bishop of Florida (1858) and later served as Bishop of Savannah (1861) and then Bishop of St. Augustine (1870). He is buried in Tolomato Cemetery in St. Augustine. Of the sixty Sisters who volunteered, eight were chosen. In August 1866, after a long and stormy voyage, the Sisters arrived in St. Augustine. Before beginning work as teachers, they had to first learn English and adjust to the new climate. Eventually they began teaching in St. Augustine, Mandarin, Palatka, Fernandina and Savannah, and their order grew in America. While most of the Sisters were from poor peasant families, we know from their letters that they well educated. On February 3, 1868, Sisters Marie Julie Roussel and Mary Bernard Martin left the convent in St. Augustine and traveled by oxcart to Mandarin. They established their first school in the original St. Joseph’s Church, where 27 black children and 51 white children learned their ABCs and arithmetic in different parts of the building. Instruction began at 9 AM and continued until 4 PM, with a midday break. Residing at the nearby home of Caroline Hartley, the Sisters walked one mile to and from the school each day, although many of their students came from as far as five miles away. The Sisters returned to St. Augustine after only three months due to illness, but in 1873, Sister Julie returned to Mandarin. Along with two other Sisters and a lay teacher, she reestablished the school in a newly renovated building on the St. Joseph’s Church property. The Mandarin Mission expanded to include a boarding school for white boys, alongside the free day school for white and black students, who continued to be educated separately. In 1898, the schoolhouse presently located in Walter Jones Historical Park was constructed for the instruction of the school’s black students, though it is not known how long it remained in use. Based on records from the decade surrounding its construction, it is likely that approximately 25 students would have attended classes within the schoolhouse. In 1943, the building was given to a school employee, Nathaniel Long, who moved it to St. Augustine Rd. and utilized it for a variety of uses. When Mr. Long died in the mid 1990’s, his daughter sold it to Dee and Peter Brown, who moved it to the south end of Mandarin Rd. Finally, in 2015, the Mandarin Museum and Historical Society partnered with Councilman Matt Schellenberg, the Mandarin Community Club, and the City of Jacksonville Parks and Recreation Department to relocate it to Walter Jones Historical Park. This project would not have been possible without the generous financial support of the Rotary Club of Mandarin and private donors in the community.